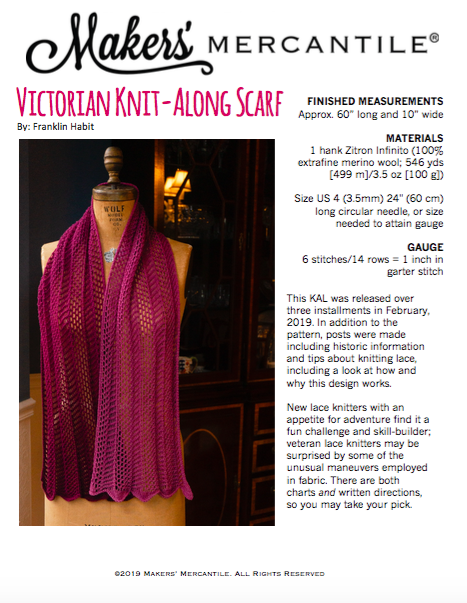 This KAL was released over three installments in February, 2019. In addition to the pattern, posts were made including historic information and tips about knitting lace, including a look at how and why this design works. 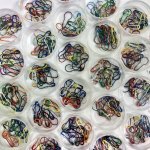 New lace knitters with an appetite for adventure find it a fun challenge and skill-builder; veteran lace knitters may be surprised by some of the unusual maneuvers employed in fabric. There are both charts and written directions, so you may take your pick. Final Row 3: K3, [k4, (yo, slp-slk-k2tbl) twice, yo, dbl dec, (yo, k2tog) twice, yo, k5] 4 times, k2.